One of the more unusual panels that I’ve ever seen at a conference was “Act Like a Writer” presented by Keith Strunk. The material focused on the author as a person and not on his/her production of material or marketing attempts. Mr. Strunk is a scriptwriter, actor, and marketing pro so he definitely knew what he was talking about. The tall gentleman stood up, clothed in a relatively loud printed button-down and tan slacks. As he spoke, he radiated enthusiasm and an energy level that the rest of the tired audience lacked as we were crowded into a small and overly warm room. I liked him immediately and he drew most of us into the interactive discussion. Turns out that his “act” was the point of the panel. He seemed like a guy you would want befriend. Certainly he would be hard to forget. His purpose on that day was to teach authors to be aware of their reputation and presentation, and he did it beautifully by example. Of the multiple ideas he presented that day, one really struck home with me. All authors should create or at least understand the persona that they present to the public. Part of this concept involves the philosophy of “don’t be a douche bag,” as he stated it. However, the idea encompasses more than simply behaving yourself in public. You should actively sculpt this outward facade and use it as part of your marketing plan every time you go into author mode at book signings or presentations. For me, this notion involves a hat. 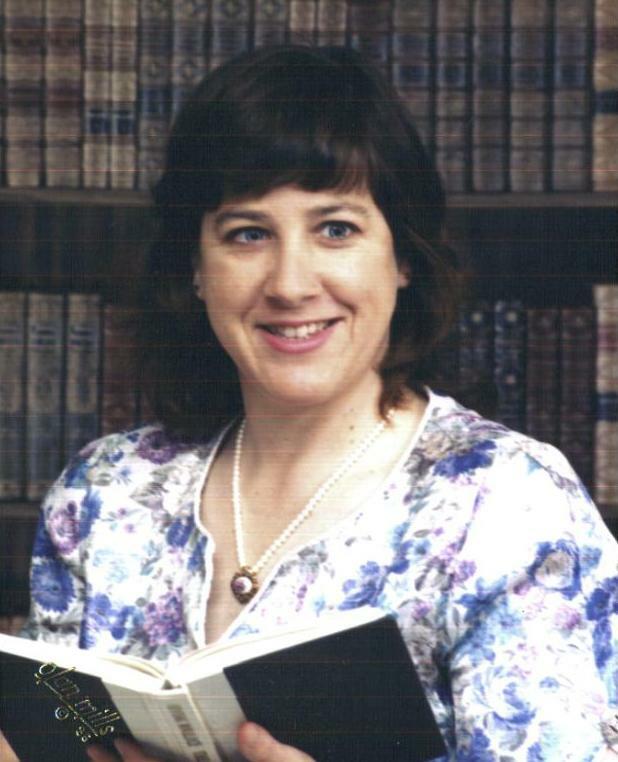 The first time I went for professional pictures to use in my writing career, I dressed in my Sunday-go-meeting clothes and full makeup. The photographer put me in front of a library-like screen with a book in my hand. After all, it’s literary looking, right? I knew it was boring but didn’t have any better suggestion. My first promo shot. Pretty but not me. The pictures looked okay except I had a certain deer-in-the-headlights, mindless glow to the eyes. The problem was that it wasn’t me. It looked, blah, boring, 2-dimensional, devoid of creative personality, and… you get the idea. A couple of years later, I tried again. Having just moved from my long-term Texas home to lovely Northwest Indiana, I was missing my western roots. I felt Texas to my core, from the constant use of “ya’all” to the tendency of wanting to put up barbed wire fencing all around my property. A person born and bred in the west has different perspectives and ways of thinking from those born in the south or New England. Like anywhere, the land and culture molds the personality of that individual. Therefore, I wanted my western heart to show through in the photos. This time, I still dolled up my hair and put on makeup but I donned jeans, a country-style shirt, a denim jacket, and my favorite white cowboy hat. Although I fought them on some of the poses they wanted to use, a few of the pictures really reflected the heart and soul of me. No deer or headlights around. I still use these pictures today and you’ll see them on this website. So now when I show up, I’m the Texas Chick. 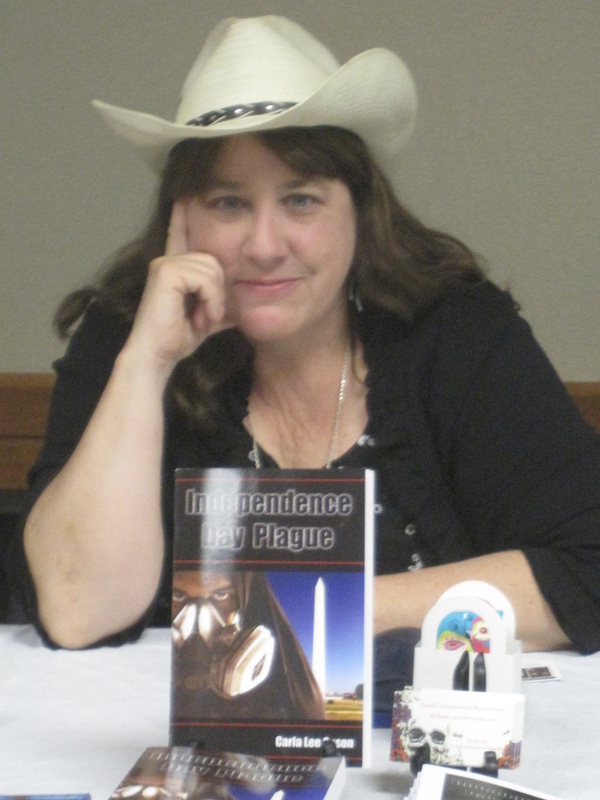 The hat and I go together to every author event, even if I lay it on the table when we are indoors (I wasn’t born in a barn). People recognize me because of the hat and comment when it is missing. For Keith Strunk, it was his visually engaging shirt and his bouncy attitude. He said it was his trademark, reflecting both his personality and presentation. To give you more marketing examples, check out Heather Graham who showed up for her panel at ThrillerFest 2014 looking like she just stepped off a romance novel cover. Famed author Terry Pratchett (may God rest his soul) also had memorable hats and a distinctive beard. Both made him easily recognizable on posters and book covers. So as you publish your first book and set up your author appearances, think about your presentation. What can you do or wear to make people remember you? What visual impact on you or your table will catch people’s eyes from across the room? Find that persona, develop and embrace it, and you’ll see an impact in your marketing. Post note: If you get a chance to meet or hear Mr. Strunk at any conference, I highly recommend it. He is wonderful. 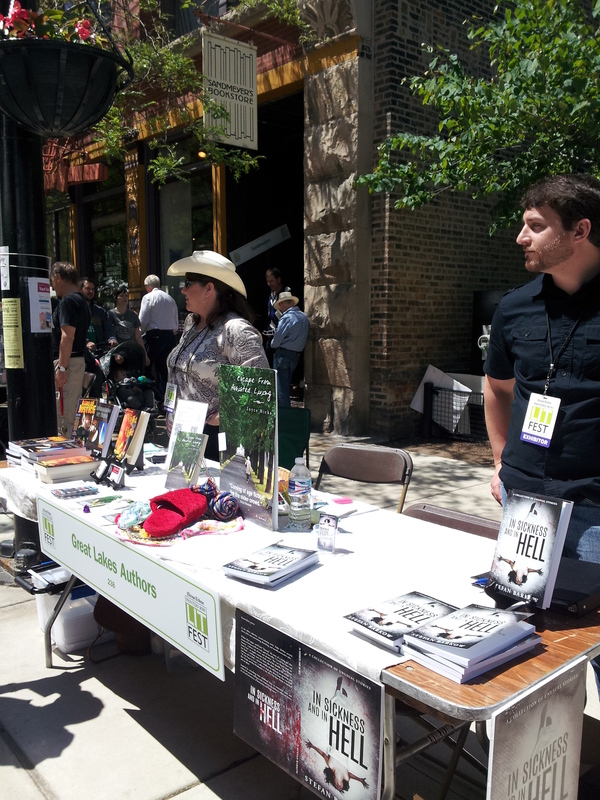 Every June, Chicago hosts a wonderful event that supports the literary world. Located downtown at the crossroads of Dearborn and Polk, Printer’s Row consists of a line of tents in the streets and smaller tables on each side. The tents feature booksellers, writing groups, and some local publishing houses, while the side tables are often authors selling their work. The two-day event sees 150,000 customers wandering around if the weather is good. A great place for authors to sell books, right? I’ve participated in Printer’s Row in 2013 by myself and again this year, sharing a table with five other people in shifts across the two days. The price per table is $350, which is hard to recoup. Working with partners made the event cheaper for each of us, which helped. Yet I still didn’t show a profit during either time. Earning a profit of $350 in book sales is practically impossible for any new and relatively unknown author. I knew that going into the 2013 event but I talked to a lot of great people, handed out stacks of marketing material and saw a small jump in my online sales because of the interactions. I also learned about new writers’ groups and eventually joined two of them. Finally, like any bibliophile, I purchased some new and used tomes for my own amusement. This year, I shared the table with two other people on each day of the show. Because a sixth author pulled out at the last minute, I had the opportunity to attend both days. The five of us banded together under the title, Great Lakes Authors, and arrived on Saturday morning eager to get started. By Sunday afternoon, I sat behind the table, feeling wet and depressed. Why was 2015 a disaster? 1. Many people assumed Great Lakes Authors was a publishing house. I didn’t think folks would make that leap but they did. At times, people blocked the table in order to pitch their manuscript or ask, “How do I get my book published?” To be fair, I’ve gotten that question at several book signings and it amazes me that people simply don’t buy a Writer’s Digest Guide or do some research online. We politely answered as best we could but those folks were not customers. They also interfered with other sales. Lesson learned: Be careful of the name you choose. Make sure it doesn’t give the wrong impression. In addition, discourage wannabe writers from hanging around to discuss the publishing world. 2. My partner’s books were not of the same genre as my work. So when a small group of older women investigated my friend’s Escape from Assisted Living book (a fun book), they hung around, chatting and ignoring all the other offerings. They also blocked the table from other potential customers. I’m not angry about this. My friend did well, selling the 15 she brought, and I’m happy for her. It is a great book that obviously garners a lot of interest. However, it was a factor in fewer sales for my thrillers and the other person’s psychological horror novel. Lesson learned: If possible, only share a table with those in the same or similar genres. 3. Adult men (my target audience) don’t impulse shop, at least not at the same rate as women. Males are also less interested in gathering autographed copies. In addition, I heard more men say, “I read e-books” than women. In answer to that, I gave them some of my handouts and hoped they would check the book out on Amazon. Lesson learned: Think about your book’s audience. Would they show up at an event like this? Some yes, but that knowledge will temper your expectations. Also remember that the changing world of publishing is affecting how people buy books. This makes book signings less effective as a marketing tool. 4. Everyone who rented a table competed for customers against the “tent people.” If the tent folks were part of an organization, offering seats to their authors for book signings, then fine. They are doing the same pitch and selling that I’m doing. However, many of the tents were often used booksellers marking their merchandise down to $3 to $5. Anyone opposite one of these bookstores had a hard time competing for the customers’ attention. Lesson learned: Avoid the costly book signing events. The competition is hard and you probably won’t recoup your entrance fee. Alternatively, split the costs with someone if possible. 5. The weather turned sour on Sunday. The promoters don’t care if our books get wet, that was our responsibility. We kept plastic paint sheets available, which helped. However, the bigger issue was the early rain kept people at home. The main shower stopped about 10 a.m., but the great flow of customers failed to show up for the rest of the day. No doubt, they looked out the window and made other plans. Lesson learned: Sometimes things just go sour. Roll with the punches and move on. Next year, I’m attending Printer’s Row as a customer. My experience as a vender wasn’t the greatest but it is still a wonderful, fun event. I made great contacts with folks, found out about existing writer support groups, and discovered some treasures. So if you are in the Chicago area next year in early June, consider checking it out. Supporting local literary groups goes a long way for creating success for all authors.